Leopard Tortoise | Zoo Med Laboratories, Inc. The Leopard Tortoises is a beautiful, large species of tortoise found throughout eastern and southern Africa. Leopard tortoises are a great choice for an intermediate to advanced tortoise keeper, but should be avoided by beginners. Of all the larger species of tortoise available, the docile and social nature of the Leopard tortoise makes it a great choice for keepers that have the space to accommodate their size. These peaceful tortoises can be kept in small groups and do well when housed together. As with all turtles and tortoises, purchasing this species is a long-term commitment. Leopard tortoises will do best if kept outdoors in temperatures that do not fall below 50°F. 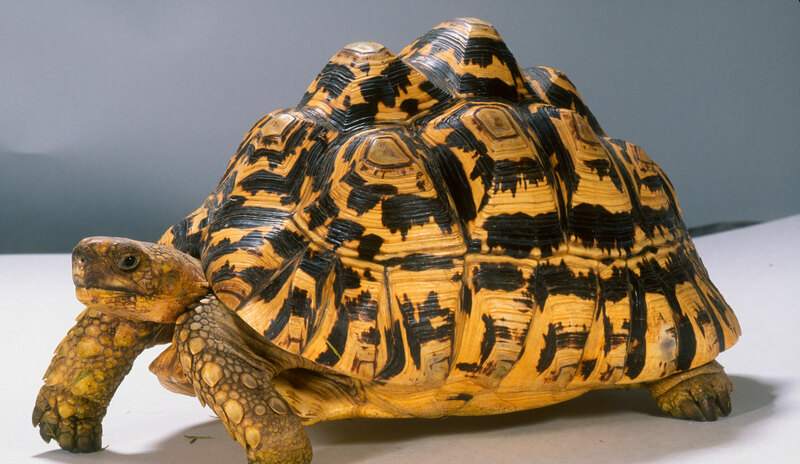 If being kept indoors, an adult Leopard tortoise will need at least a space of 80 ft². Zoo Med’s Tortoise House™ is an ideal enclosure to house this species as a hatchling and juvenile. The Tortoise House™ can be taken outdoors to provide natural sunlight when temperatures permit. Zoo Med’s Tortoise Play Pen™ is an excellent way to occasionally offer natural sunlight and grazing opportunities to your tortoise if it is being kept indoors. A Leopard tortoise will eventually outgrow both of these enclosures as it matures. Zoo Med’s Basking Spot Lamp™, Repti Halogen™, Ceramic Heat Emitter, and ReptiTherm® Under Tank Heaters are good choices for heating tortoise enclosures. The ReptiTherm® Habitat Heater is a great way of offering large tortoises heat. UVB Lighting is essential for tortoises to process calcium when kept indoors. Without UVB lighting tortoises will develop serious health problems such as abnormal shell growth and other deformities. UVB Lighting should be left on for 10-12 hours a day and turned off at night. Tortoises that are kept outdoors will get all of the UVB they need from exposure to natural sunlight. Leopard tortoises live in arid places in the wild and will do well on a variety of dry substrates in captivity. Forest Floor™, Eco Earth® and ReptiSand® can all be used as substrates. It is important to offer your tortoise both dry and humid areas within their enclosure. This species will readily burrow underground where temperatures are cooler and humidity is higher. Always offer a humidity chamber, or a humid hide-box that your tortoise can fit completely into. New Zealand Sphagnum Moss or Eco Earth® can be used to hold moisture and provide this humid microclimate. Create the optimum substrate mix with 1/3 Zoo Med’s Forest Floor®, 1/3 Zoo Med’s Eco Earth®, and 1/3 Zoo Med’s ReptiSand® or REPTIFRESH®. We recommend providing a deep layer of substrate to allow your tortoise to burrow. Leopard Tortoises require a high fiber, low protein diet that is rich in calcium. It is essential to supplement your tortoise’s diet with Repti Calcium™ and ReptiVite™ as directed to provide balanced nutrition. Providing access to a Tortoise Block™ or Turtle Bone allows a tortoise to wear down its beak properly while supplementing the diet with necessary calcium. Fruits should only be offered on occasion and should make up less than 5% of the total diet. Cantaloupe, strawberries, apples and other non-citrus fruits will be accepted. Zoo Med’s Fruit-Mix-Ins™ can be mixed into pelleted foods to add diversity to the diet. Leopard tortoises will drink standing water out of a water bowl. Provide fresh water every day. Zoo Med’s Repti-Ramp™ Bowl makes an ideal water dish that allows your tortoise easy access to fresh water. Treat all water with ReptiSafe™ water conditioner to remove any harmful chemicals from tap water.